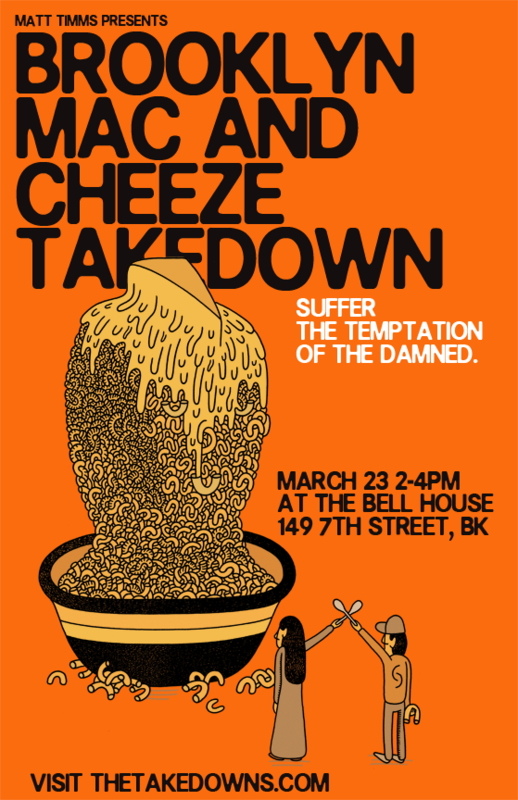 After taking a competitive cooking hiatus, I am gearing up for the Brooklyn Mac and Cheeze Takedown this coming Sunday, March 23rd, at the Bell House from 2:00pm to 4:00pm. The event sold out in a ridiculously short amount of time (tickets were gone faster than I ever remember any Takedown selling out), which can only mean one thing: NYC is READY FOR CHEESY GOODNESS RIGHT NOW! So before the weather turns definitively spring-like, this will be rich comfort food’s last stand before making way for tender lettuces and baby veg. For those of you who have tickets, I look forward to seeing you there! And for those of you who were not able to score them in time, I promise I will keep you all updated! In the meanwhile, here is how you can help me out. I am still mulling over ideas for the Takedown and haven’t decided what to make yet! Any and all ideas are welcome! Those all sound amazing, dearest Hajusuuri! I am really liking the idea of the mock shepherd’s pie . . . but they are all good ones! Thank you for the good luck wishes as well! My kitchen is going to be trashed setting up all these samples! I would offer to taste test but knowing you…you’ll be cooking during the wee hours and this puppy needs her beauty rest! You know me so well! Yes, I have a friend who has offered to come and help me on Saturday. Hopefully, it will get me to start earlier — which is so hard with my schedule. In any case, let’s cross fingers for an earlier rather than a later night! Love, love, love all those suggestions, Poodle! Especially the Buffalo chicken one. I would probably by the wings to save time and use blue cheese in the sauce. Terrific ideas! OMG! I’ve never heard of the site before! It is brilliant, inspiring, awe-inspiring, and a wee bit scary! Looks like some artery-hardening fun to be had. Will peruse and report back! Thank you for letting me know! Naturally, you’ll have to include bacon in there somewhere 🙂 Good Luck!!! Naturally 🙂 Although, it’s a hard call. I think this is one of the events where a lot of the audience is vegetarian so it’s going to be tough in terms of judging . . . but I will keep everyone updated! Vegetarian? How about Mac and cheese primavera with lots of spring veggies? That’s a great idea!!! Go for the vegetarian vote! Actually, I think you need to use tofu instead of cheese and vegi-bacon and you don’t tell anyone until AFTER it’s all over and you’ve won! I don’t think I can! When I was a vegetarian, I would say that fake bacon tasted just like real bacon. It doesn’t at all! It just meant that it had been a really, really long time since I had eaten real bacon! I can’t suggest anything original, the best mac n’ cheese I ate was a simple one: a simple mac n’ cheese with simple truffles. You can’t beat that! A truffled mac and cheese sounds divine! I’m torn between doing a classic mac and cheese but just really well, and doing something crazy. I think I just salivated all over the front of my shirt. I LOVE good mac and cheese. No doubt, there will be some interesting variations at the event! My recommendation, some kind of mac and cheese with Tabasco. Yumminess. Me too! It’s really one of my favorite dishes ever. I am looking forward to seeing what people come up with (and am a little intimidated as well!). Hot sauce! Everyone love a spicy mac 🙂 Have you tried it with sriracha? Yumminess too! I have not, but you could put Spam in Mac and Cheese and I’d be happy! Spam is a terrific idea! Like putting hot dogs in mac and cheese! AW! Thank you, dear Ari! More macsagna for you! I always love the Take Down posters! Please report back on how it all went! Even though I am not a fan of blue cheese, I can appreciate it in a dish. Gorgonzola and fig mac and cheese would have been expensive but decadent. Aren’t they great? So creative! Will report very soon! The semester has been busy lately, but only four more weeks to go! And a Gorgonzola and fig mac and cheese sounds absolutely divine!